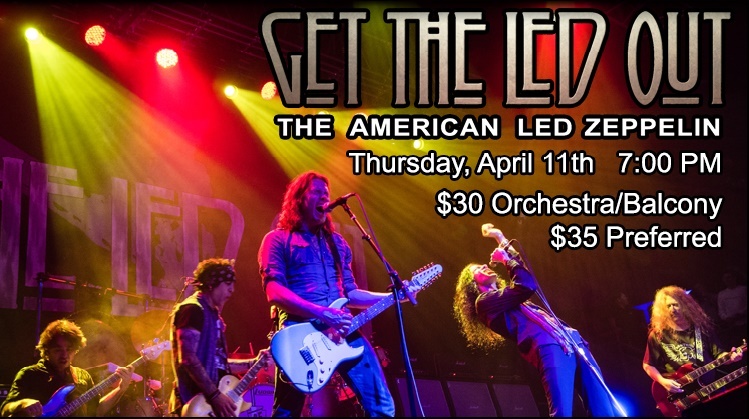 Get the Led Out, hailed as “The American Led Zeppelin,” premieres at the Eichelberger after sold-out shows across the country! Hear the songs that the legendary Led Zeppelin created including “Kashmir,” “Whole Lotta Love,” “Dazed and Confused” and the iconic “Stairway to Heaven.” This high-energy concert captures the essence of the music of Led Zeppelin and brings it to the concert stage. This is a group of musicians who were fans first, striving to do justice to one of the greatest bands in rock history! Tickets: $30 Orchestra/Balcony, $35 Preferred.